Reminder No. 1: Voting on the final round of the Reader Survey ends Wednesday at 9pm. Read more about the survey here. Reminder No. 2: December's Virtual Tasting is the 2007 Brian Carter Cellars Abracadabra and takes place on Monday December 21st. Read more about it here. 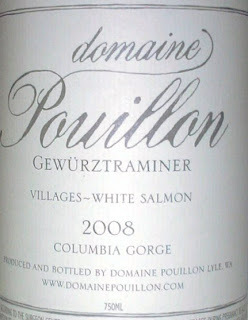 Domaine Pouillon is located in the Columbia Gorge in Lyle, Washington. The winery is named after owners Alexis and Juliet Pouillon. The Pouillons moved to the Columbia Gorge in 2005 with the aim of starting a family winery. Domaine Pouillon focuses on small lot production using fruit from biodyamically farmed vineyards. In addition to the Gewurztraminer sampled below, the winery produces a Syrah/Cabernet blend (Pierre), a Grenache/Syrah/Mourvedre blend (Black Dot) and several white blends. The wine sampled here is a standout with a complex nose and a palate that is literally like drinking flowers. Domaine Pouillon produces 1,500 cases of wine annually. An incredibly complex, aromatic nose with fresh pineapple, lemon rind, honey, and mineral. Numerous sweet as well as acidic notes. A beautiful, but surprisingly understated palate that is like drinking a bouquet of flowers with the occasional orange peel mixed in. There is a bit of residual sugar, but not much. The palate evolves swiftly after opening, becoming considerably more acidic and developing an almost spritzy feel before settling back down. An exceptionally long finish. 13.8% alcohol.